Name Variation John W. Ruhland was also known as J. W.
John W. Ruhland was born on 9 August 1878 at Wisconsin also reported as Apr 1879. He was the son of Johann Baptist Ruhland and Maria Anna Herbig. John W. Ruhland married Josephine Mary Laubmeier, daughter of Joseph Laubmeier Sr. and Mary (? ), on 18 November 1908. John W. Ruhland died on 17 July 1963 at age 84. [S245] U.S. Federal Census 1900 U.S. Federal Census, by Ancestry.com, ED134. Dwelling 169. 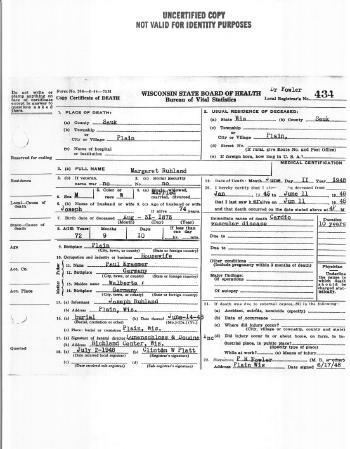 [S364] Wisconsin State Census Wisconsin State Censuses, 1895 and 1905, by Ancestry.com, Dwelling 98. [S243] U.S. Federal Census 1920 U.S. Federal Census, by Ancestry.com, ED160. Dwelling 114. Married Name 18 November 1908 As of 18 November 1908,her married name was Ruhland. Josephine Mary Laubmeier was born on 13 December 1890 at Wisconsin. She was the daughter of Joseph Laubmeier Sr. and Mary (?). 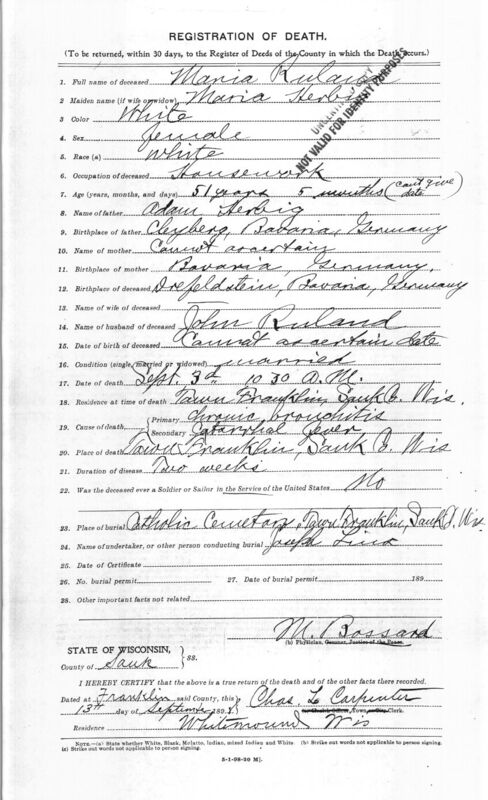 Josephine Mary Laubmeier married John W. Ruhland, son of Johann Baptist Ruhland and Maria Anna Herbig, on 18 November 1908. Josephine Mary Laubmeier died in March 1968 at age 77. 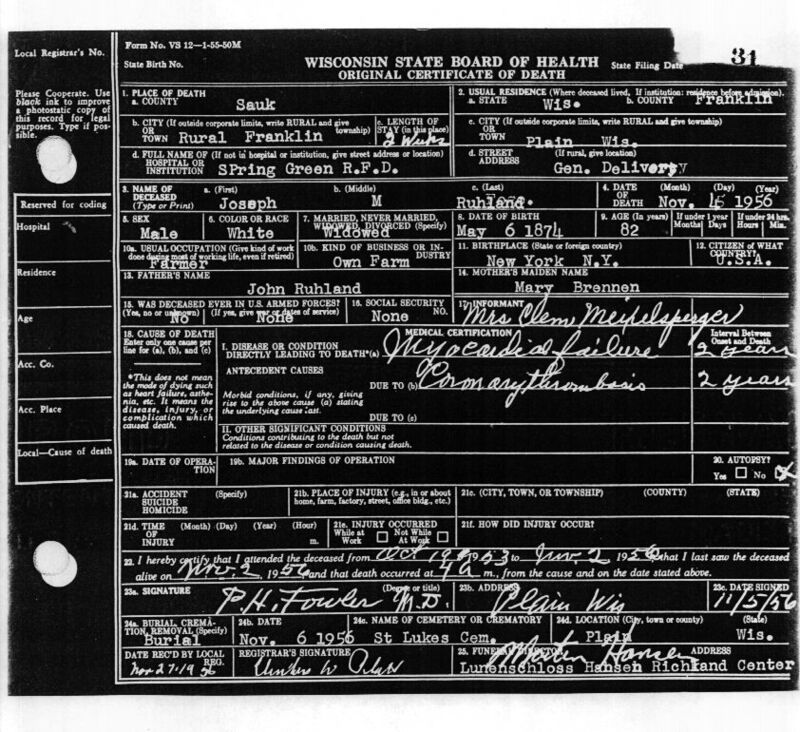 Josephine Mary Laubmeier obtained US Social Security Card at Wisconsin; last residence Plain, Sauk, Wisconsin. [S245] U.S. Federal Census 1900 U.S. Federal Census, by Ancestry.com, ED129. Dwelling 42. Name Variation Herbert J. Ruhland was also known as Herb. Herbert J. Ruhland married Lucy M. (?). Herbert J. Ruhland was born on 22 August 1912 at Wisconsin. He was the son of John W. Ruhland and Josephine Mary Laubmeier. Herbert J. Ruhland died on 21 February 1998 at age 85. 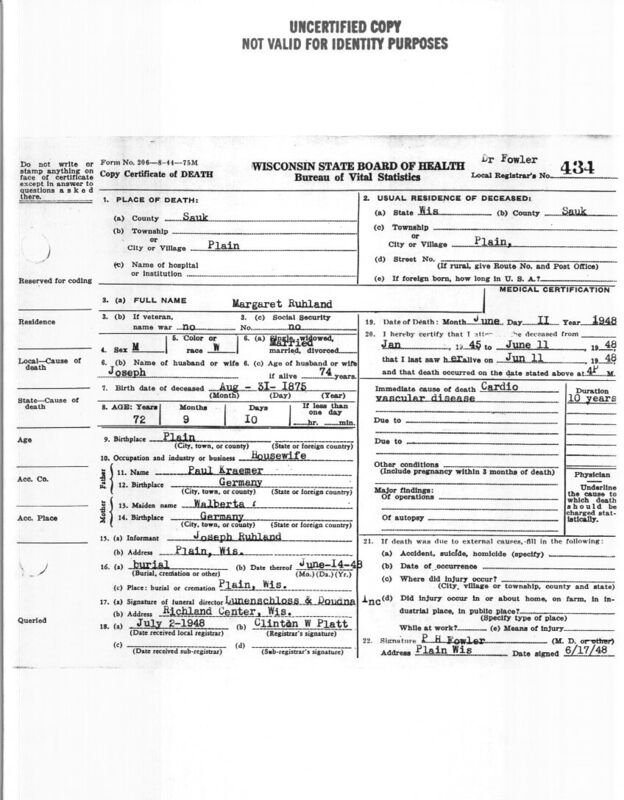 Herbert J. Ruhland obtained US Social Security Card at Wisconsin; last residence Plain, Sauk, Wisconsin. Elizabeth Ruhland was born circa 1916 at Wisconsin. She was the daughter of John W. Ruhland and Josephine Mary Laubmeier. Josephine Ruhland was born circa 1918 at Wisconsin. Lucy M. (?) married Herbert J. Ruhland, son of John W. Ruhland and Josephine Mary Laubmeier. Lucy M. (?) was born in 1914 at Wisconsin. Ervin H. Ruhland died in 1937. He was born in 1937. He was the son of Herbert J. Ruhland and Lucy M. (?). Name Variation Johann Baptist Ruhland was also known as Red. Name Variation Johann Baptist Ruhland was also known as Ruland. Name Variation Johann Baptist Ruhland was also known as John P.
Johann Baptist Ruhland married Maria Anna Herbig, daughter of Adam Herbig. Johann Baptist Ruhland was born on 12 November 1842 at Bavaria, Germany, also reported as 18 Nov 1842. He was the son of Georg Zilker and Barbara Ruhland. 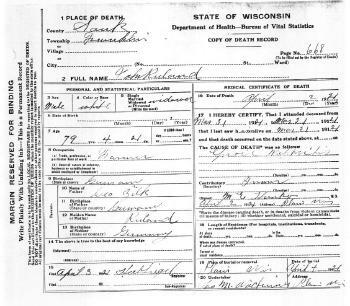 Johann Baptist Ruhland died on 2 April 1921 at Franklin, Sauk, Wisconsin, at age 78. Name Variation Maria Anna Herbig was also known as Gruber. Name Variation Maria Anna Herbig was also known as Brennen. Married Name Her married name was Ruland. Name Variation Maria Anna Herbig was also known as Mary. Name Variation Maria Anna Herbig was also known as Herpich. Maria Anna Herbig married Johann Baptist Ruhland, son of Georg Zilker and Barbara Ruhland. Maria Anna Herbig was born on 24 June 1847 at Drefeldstein, Bavaria, Germany. She was the daughter of Adam Herbig. Maria Anna Herbig died on 3 September 1899 at Franklin, Sauk, Wisconsin, at age 52 52y 2m 9d; also reported as 51 years 5 months. Name Variation Joseph Michael Ruhland was also known as Ruland. Joseph Michael Ruhland was born on 6 May 1874 at New York also reported as 6 May 1873. 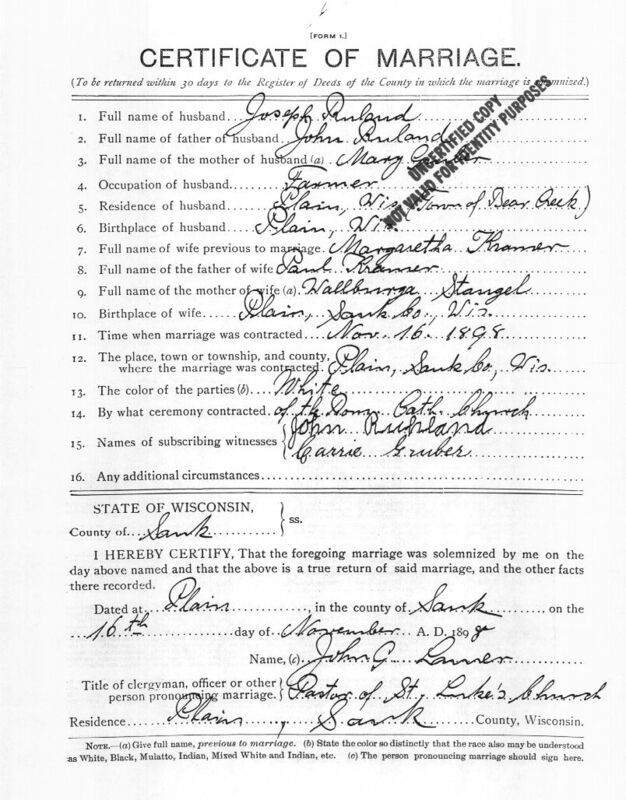 Joseph Michael Ruhland married Margaret Kraemer, daughter of Paul Kraemer and Walburga Stangel, on 16 November 1898 at Plain, Sauk, Wisconsin. Joseph Michael Ruhland died on 4 November 1956 at Franklin, Sauk, Wisconsin, at age 82. Married Name 9 June 1913 As of 9 June 1913,her married name was Smyth. Mary Ann Ruhland was born on 31 July 1876 at Wisconsin. She was the daughter of Johann Baptist Ruhland and Maria Anna Herbig. Mary Ann Ruhland married John Henry Smyth on 9 June 1913. Name Variation Margaret Kraemer was also known as Maggie. Name Variation Margaret Kraemer was also known as Margaretha. Married Name 16 November 1898 As of 16 November 1898,her married name was Ruland. 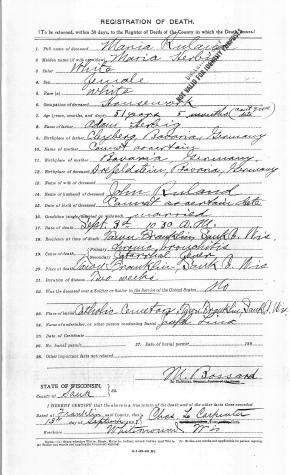 Married Name 16 November 1898 As of 16 November 1898,her married name was Ruhland. Margaret Kraemer was born on 31 August 1875 at Plain, Sauk, Wisconsin. She was the daughter of Paul Kraemer and Walburga Stangel. 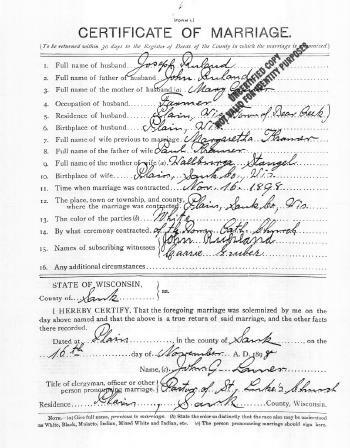 Margaret Kraemer married Joseph Michael Ruhland, son of Johann Baptist Ruhland and Maria Anna Herbig, on 16 November 1898 at Plain, Sauk, Wisconsin. Margaret Kraemer died on 11 June 1948 at Plain, Sauk, Wisconsin, at age 72. [S246] U.S. Federal Census 1880 U.S. Federal Census, by Ancestry.com, Year: 1880; Census Place: Franklin, Sauk, Wisconsin; Roll: 1446; Family History Film: 1255446; Page: 99A; Enumeration District: 251. Married Name 15 May 1901 As of 15 May 1901,her married name was Aron. 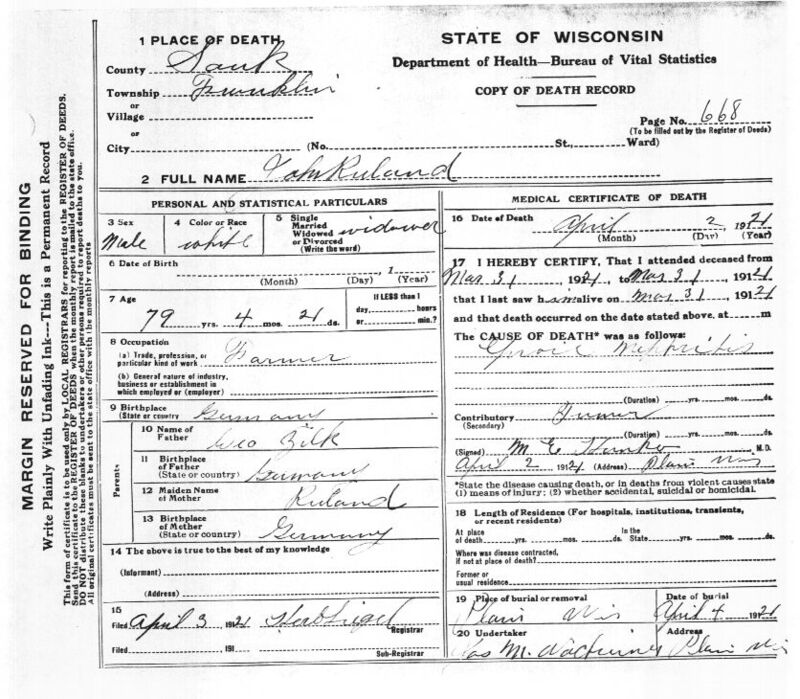 Carrie Ruhland was born on 15 May 1881 at Wisconsin also reported as Mar 1882. Carrie Ruhland married Elias Aron on 15 May 1901. Carrie Ruhland died on 26 January 1970 at age 88. Frank Ruhland was born in January 1883 at Wisconsin. Frank Ruhland died on 24 April 1926 at age 43. Name Variation Alois A. Ruhland was also known as Alos. Alois A. Ruhland was born on 6 July 1887 at Wisconsin. Alois A. Ruhland married Christina Anna Schwartz on 12 July 1910. Alois A. Ruhland died on 21 January 1959 at age 71. [S243] U.S. Federal Census 1920 U.S. Federal Census, by Ancestry.com, ED164. Dwelling 166. Name Variation Ferry F. Ruhland was also known as Francis. Name Variation Ferry F. Ruhland was also known as Fary. Name Variation Ferry F. Ruhland was also known as Caver or Xaver. Ferry F. Ruhland was born on 16 November 1889 at Wisconsin also reported as May 1890. Ferry F. Ruhland died on 5 June 1976 at age 86. 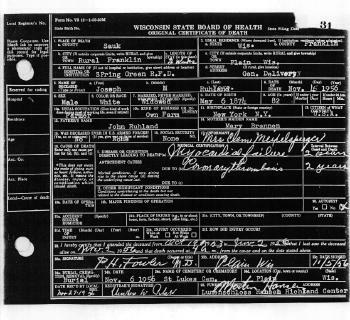 Ferry F. Ruhland obtained US Social Security Card at Wisconsin; last residence Plain, Sauk, Wisconsin. Wis. Mech. Co. K 45th Inf. Married Name 12 July 1910 As of 12 July 1910,her married name was Ruhland. Christina Anna Schwartz was born on 7 November 1893 at Wisconsin. She married Alois A. Ruhland, son of Johann Baptist Ruhland and Maria Anna Herbig, on 12 July 1910. Christina Anna Schwartz died in 1958. Charles A. Ruhland was born on 14 July 1921. He was the son of Alois A. Ruhland and Christina Anna Schwartz. Charles A. Ruhland died on 17 July 1944 at killed in action - WW II - Tec 5 Coast Arty. Corps at age 23. Daniel M. Ruhland was born on 12 April 1925. Daniel M. Ruhland died on 28 July 1956 at age 31. S. 1 U.S. Coast Guard Res. Florence Ruhland was born circa 1912 at Wisconsin. She was the daughter of Alois A. Ruhland and Christina Anna Schwartz. Name Variation Erma Marie Ruhland was also known as Irma Marie. Erma Marie Ruhland married Walter Jacob Haas, son of John A. Haas and Anna M. Heiser. Erma Marie Ruhland was born on 11 November 1913 at Wisconsin. Erma Marie Ruhland died on 27 December 1991 at Wisconsin at age 78. Edward Ruhland was born circa 1917 at Wisconsin. John Henry Smyth married Mary Ann Ruhland, daughter of Johann Baptist Ruhland and Maria Anna Herbig, on 9 June 1913. Elias Aron was born on 14 June 1869. He married Carrie Ruhland, daughter of Johann Baptist Ruhland and Maria Anna Herbig, on 15 May 1901. 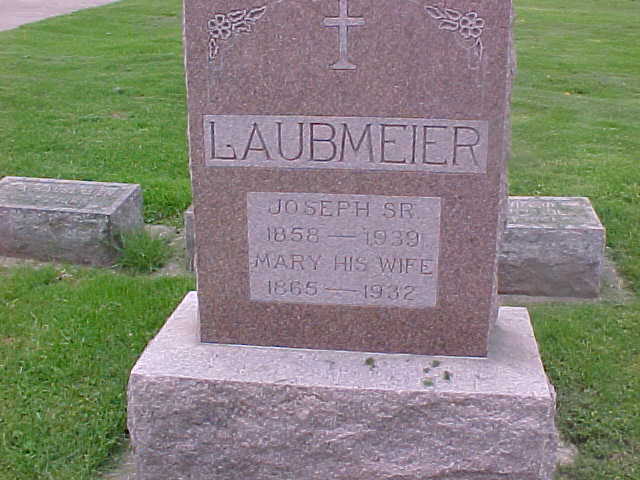 Name Variation Joseph Laubmeier Sr. was also known as Laubmeyer. 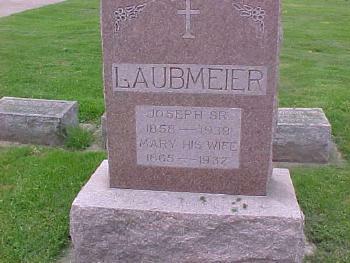 Joseph Laubmeier Sr. married Mary (?). Joseph Laubmeier Sr. was born in December 1858 at Germany. He was buried in 1939 at St Luke Catholic Cemetery, Franklin, Sauk, Wisconsin. Married Name Her married name was Laubmeier. Mary (?) married Joseph Laubmeier Sr.
Mary (?) was born in October 1865 at Wisconsin. She was buried in 1932 at St Luke Catholic Cemetery, Franklin, Sauk, Wisconsin. Children of Mary (?) and Joseph Laubmeier Sr.
Barbara Laubmeier was born in December 1894 at Wisconsin. Alois J. Laubmeier was born on 17 March 1897 at Sauk, Wisconsin. He was the son of Joseph Laubmeier Sr. and Mary (?). Alois J. Laubmeier married Elizabeth Heiser, daughter of Henry Heiser and Margaret Schwartz, before June 1918. Alois J. Laubmeier died in 1959. On 5 June 1918 at World War I Draft Registration, Sauk, Wisconsin. John J. Laubmeier was born on 2 December 1904. John J. Laubmeier died on 8 April 1905 at 4m 6d.